CLOSE FINISH Maximan goes under narrowly to Tiger Tara last weekend. A STRING of placings at Melton and Menangle have the Tritton Express ready to strike gold at this afternoon’s Menangle meeting. On face value it would appear Shane and Lauren Tritton had a disappointing weekend. 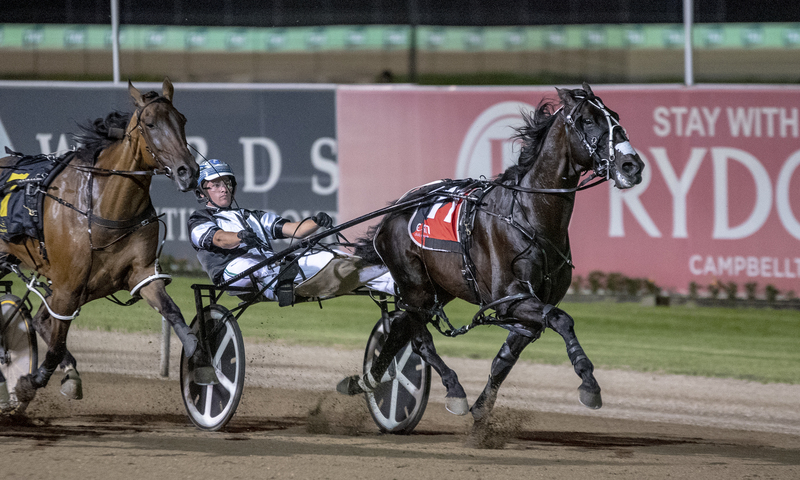 Two of their current crop of ace youngsters, Muscle Factory and Petes Big Jim ran placings at Ballarat in separate heats of the Victoria Derby. Both were piloted by Lauren, while on the home front, at Menangle, Luvumum and Maximan had to settle for close second placings as well, with Inter Dominion finalist Maximan going under to Tiger Tara by a mere half head. Still third string reinsman Josh Aiken made the night a little more palatable for the Trittons when he scored a strong win with the speedy My Alpha Rock ($1.30 favourite). Team Tritten return to Menangle today with four favourites on the nine-race card and their No.1 driver Lauren back on her home track. The fun should start for the Menangle-based partners in Race 4 when $3.50 equal favourite Courage Lips looks for an all-the-way win over the 1609m. The Courage Under Fire mare has only had three starts this season and only two runs for the Trittons since joining their team, for a fourth at Menangle followed by a 2.8m second to Gold Rocks here last week. With a win and five placings from just nine starts, this race looks ideal. Race 6 also looks to be heading to Team Tritton as well with $3.50 favourite Falcon Stride looking for his fourth win from his past five starts for big-spending owners Emilio and Mary Rosati. Falcon Stride has shown good gate speed in two of those runs and if Lauren decides she can catapult to the lead from the wide gate, she might also look for another all-the-way win. In what could be a day to remember for the young mother, Lauren will also partner veteran mare My Riviera Belle in Race 8 as she looks to break through for her first win this season. The Bettors Delight-bred mare actually boasts a terrific record with 16 wins and 21 placings from 73 starts but hasn’t fired this season with four unplaced runs although her fifth at Menangle last start showed the signs were there. Lauren hasn’t driven this mare in a race for six months and is back on board the $2.75 favourite today but she will need to be at her best to conquer a strong field of C5 or better pacers. And to end the day Lauren also drives $4 favourite Murry in Race 9 as the $14,000 claimer looks to win his third race from six starts this season.